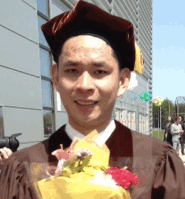 The Document and Pattern Recognition Lab started in Summer 2007. We research pattern recognition and machine learning techniques for extracting and searching information in documents and videos. Our work has appeared in top venues including TPAMI, CVPR, and SIGIR. Some of our projects have been used by groups around the world, such as the Tangent formula search engine, and the CROHME handwritten math recognition benchmark. Members. 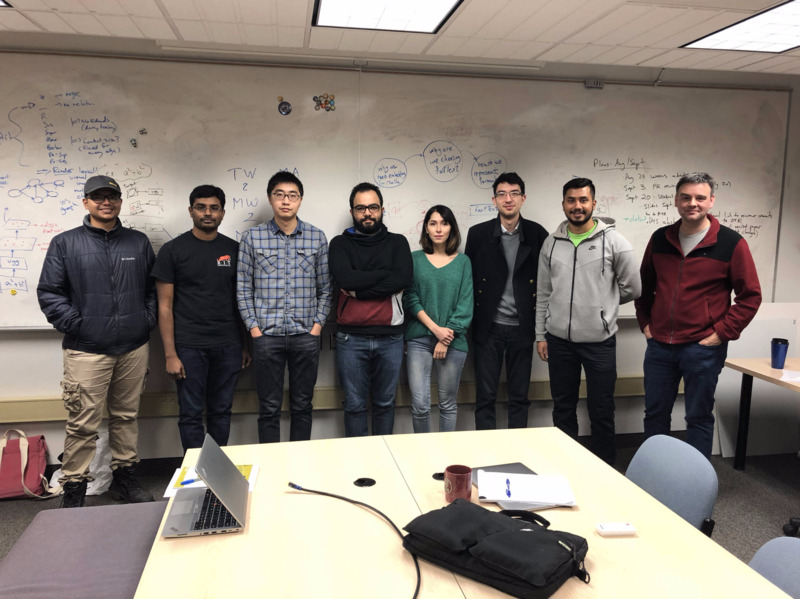 University students of all levels (BSc, MSc, and PhD) from the Computing and Imaging Science colleges at RIT have worked in the lab. 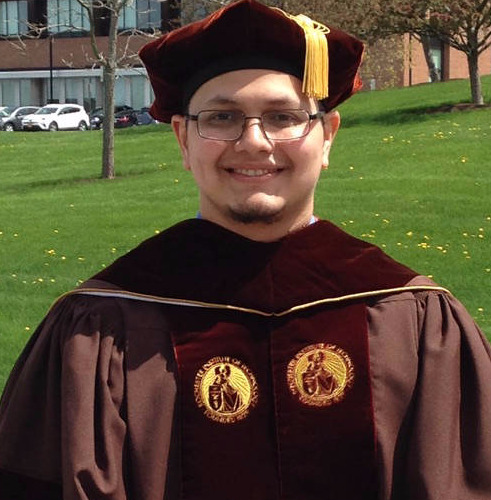 See the Members page for pictures and a list of all students who have worked in the lab. Support. The dprl has supported by a variety of organizations including the NSF, Xerox, Google, and the Alfred P. Sloan Foundation. See the Support page for details. Lately we are focused on the recognition and retrieval of mathematical notation for the MathSeer project. Examples projects, along with links to our publications, data, and software can be found on the Resources page. Left-to-right: Parag, Puneeth, Wei, Behrooz, Mahshad, Thomas, Abishai, and Dr. Zanibbi. 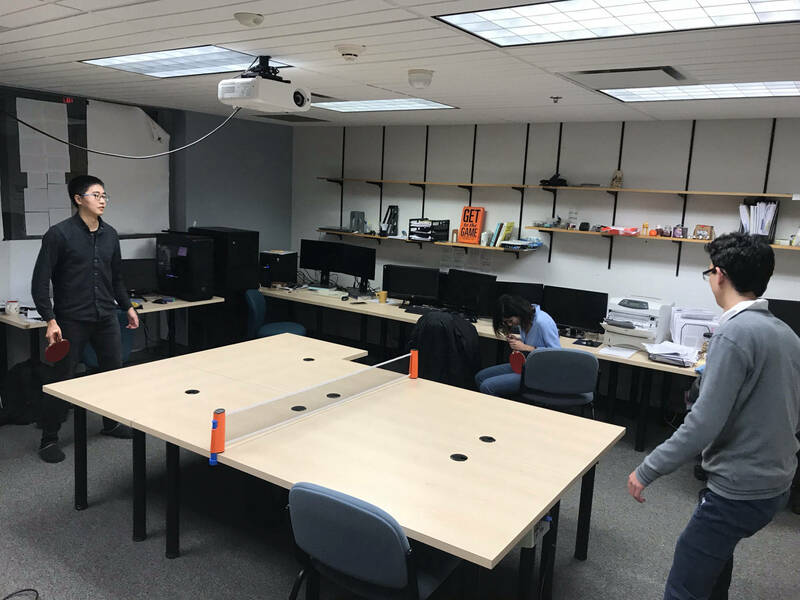 Wei, Mahshad and Thomas taking a break, trying out our ping-pong set, Fall 2018. 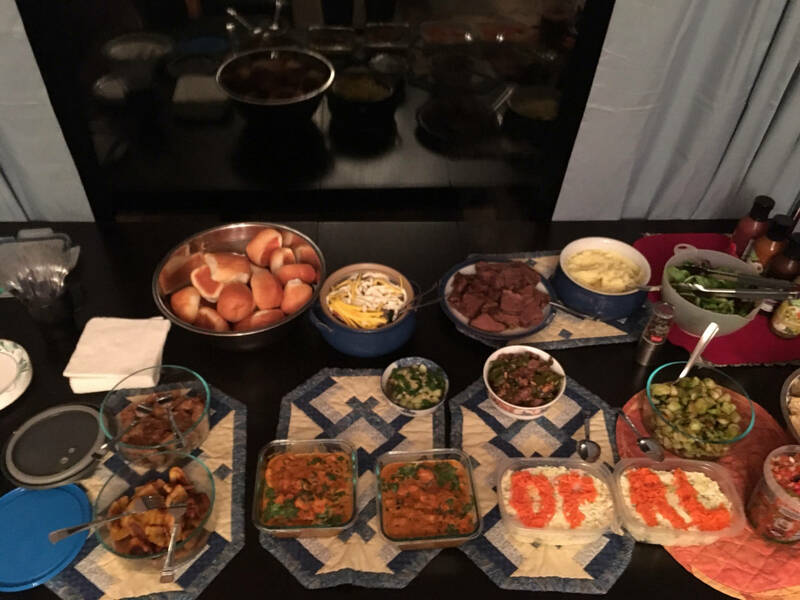 Picture of the food at our first potluck! The dishes originate from China, France, Honduras, India, Iran, Canada and the USA. DPRL carrot art: Behrooz Mansouri. 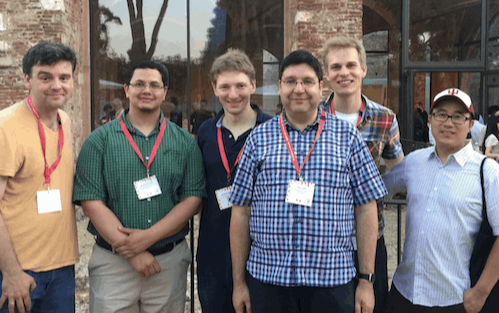 Left-to-Right: Richard Zanibbi, Kenny Davila, Moritz Schubotz, Iadh Ounis, Bela Gipp, and Lingcai Gao. 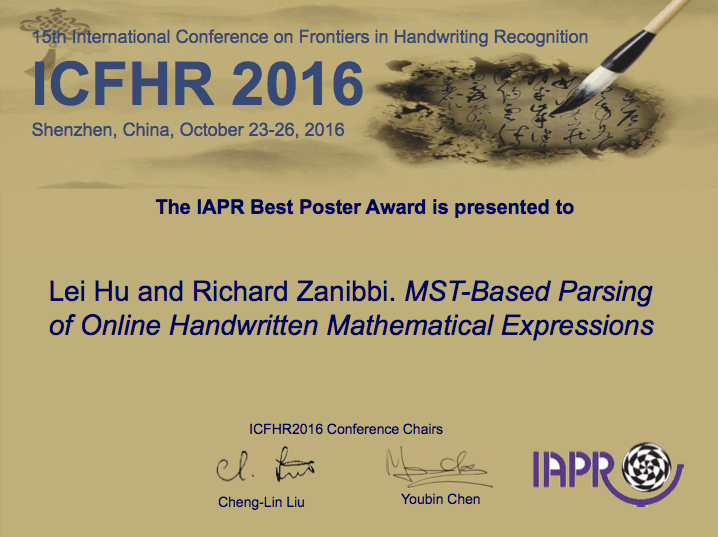 Lei Hu received the Best Poster Award at the leading international handwriting recognition conference in 2016, for his work on handwritten math recognition. 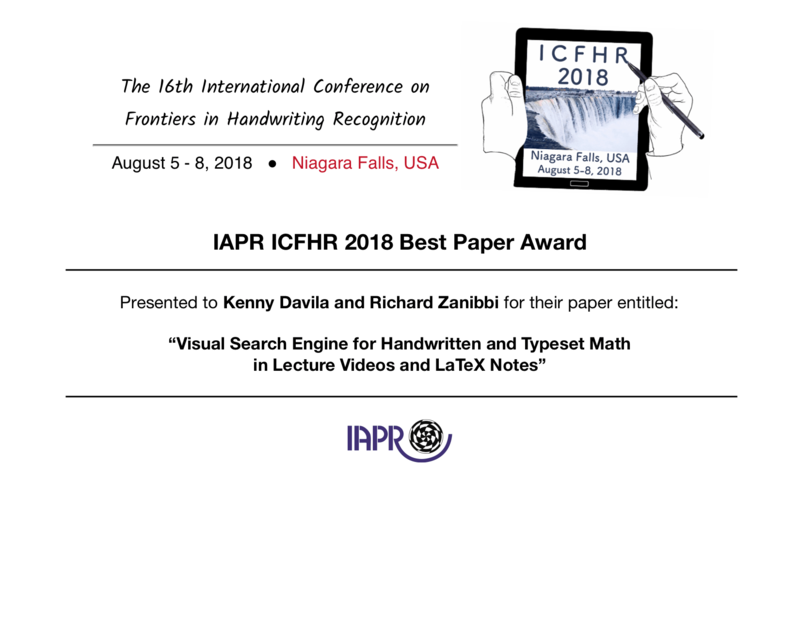 Kenny Davila received the Best Paper Award at ICFHR 2018 for his work on searching for math in lecture videos using LaTeX formulas. 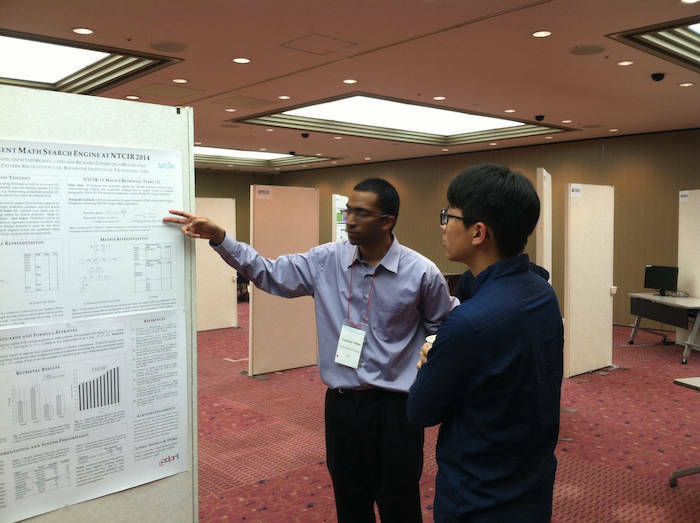 Master's student Nidhin Pattaniyil presenting the Tangent math-aware search engine at NTCIR-11 (Tokyo, 2014). The dprl and CUBS (Univ. Buffalo) hosted ICFHR 2018 in Niagara Falls, USA. 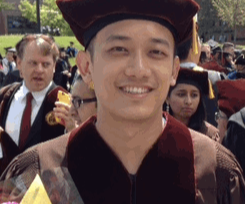 Richard Zanibbi was a Co-Chair; Mahshad Mahdavi, Thomas Choi, and Kenny Davila assisted with running the conference. Details can be found on the ICFHR 2018 website.